Cary Chadwick, UConn CLEAR, used the research results on black bears in Connecticut to create a companion “story map,” an application created by GIS industry leader Esri that enables the seamless combination of online maps with other types of information such as images, videos, graphs and graphics. Story maps are designed to communicate complicated information, data, and analysis to the public in a user-friendly, interactive story-telling experience. • Additional information from UConn’s Wildlife and Fisheries Conservation Center and CT DEEP. Visit the Bears Story Map: https://s.uconn.edu/bears. With funding from CT DEEP, CLEAR has acquired and made available on CT ECO a new statewide, high-resolution, impervious cover data layer. While acquired to support new stormwater regulations, the layer can be used for other purposes as well. Statewide, 1 foot resolution raster (pixel) data where each pixel is one of three classes (buildings, roads and other impervious). The 2017 Municipal Separate Storm Sewer System (MS4) General Permit regulation requires certain towns and institutions to calculate directly connected impervious area. To assist communities in meeting this requirement, CT DEEP funded the acquisition of the a statewide impervious layer (based on 2012 imagery) that may be useful in calculating directly connected impervious area and tracking disconnects of impervious cover. A company called Quantum Spatial did the work. They used 2012 statewide aerial imagery which has 1 foot pixels and classified it which means identifying all pixels in the imagery that represent buildings, roads and other impervious. The rest of the pixels were excluded as they were not impervious land cover. In some places, towns and/or regional governments contributed detailed GIS data that was incorporated into the layer. 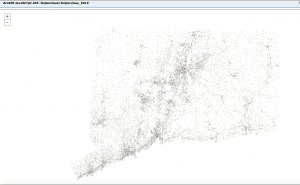 The CT ECO website has a whole section devoted to the Connecticut MS4 Supporting Layers which includes the impervious surface data. View. Take a quick peak at the layer. 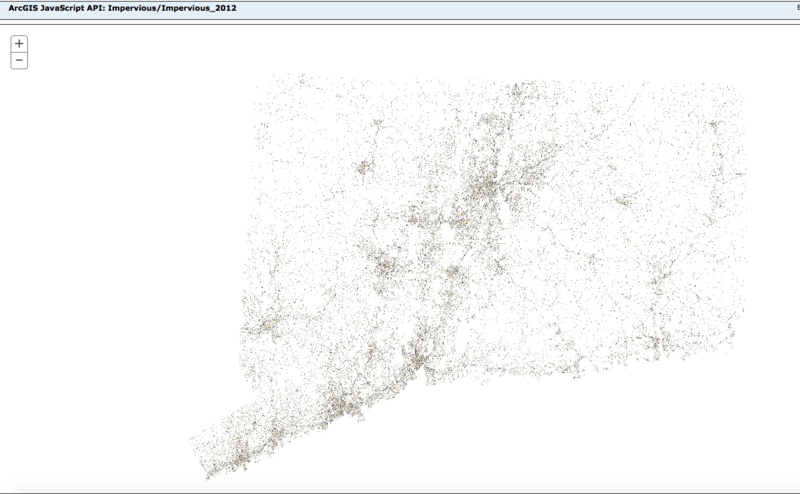 Or view it in context in the CT MS4 Viewer (look for Statewide Impervious Cover (2012) down a ways on the Layer List). Connect. GIS users can connect to the map services of impervious surface. Three flavors are available. The original raster data is available as map services in two different projections. One is in Web Mercator Auxiliary Sphere (service called Impervious_2012) which is best for online mapping and web viewers. The other is in Connecticut State Plane NAD83 Feet which is better for desktop GIS mapping when other layers are also in the Connecticut State Plane coordinate system (service called Impervious_2012_StatePlane). The smoothed vector version (see formats section below) is also a map service in Connecticut State Plane NAD83 feet (service called Impervious2012_simplified_vector_StatePlane). Download. GIS users can download the files. Formats available described below. The impervious surface data is available in several different flavors that all originated from the same base. Raster. The raster format is the original. Download by town (extended area*). Vector Original. The vector format was created by taking the raster layer and converting it to polygons instead of pixels. Polygons have area. Here, the polygon edges are still jagged because they originated from pixels. The outlines are shown as an example. Download by town in a geodatabase contain a clip of just the town boundary and one of the town extended area*. Vector Smoothed. Through a fortunate turn of events, there is also a smoothed version of the vector. Here, the jagged vectors have been smoothed through geoprocessing methods. Download statewide layers for buildings, roads and other impervious. Each is in a separate file. * Extended area refers to a rectangular area larger than the town (detailed explanation here). It’s summer. Family vacation time. I don’t know about you, but I’ve been waiting for this all year. We had planned to take the family west for two weeks in the mountains. Utah, Wyoming, Montana, and Idaho. Yellowstone and Grand Teton National Parks. Off the beaten path. Round up the kids, pack up the camping gear (and also…arrange flights, rent an RV, organize logistics, do we have the bug spray? ), and let’s go! The truth is, in the weeks leading up to the trip, work kept me BUSY (see here) and I slacked when it came to researching the fine details of the trip. I didn’t worry too much, we had made our critical Yellowstone campground reservations months before. We had a place to stay. We could figure the details out when we got there. But as it turns out, I (like many others) had forgotten one minor detail. These rugged places, some of the most beautiful land our country has to offer, is lacking only one thing…cell phone service. What sounds like a bonus feature of being in the mountains (and it was), also made my on-the-fly planning a little more challenging. I’m sure I don’t have to tell you this, but one thing became pretty clear to me on this trip – we live in a world that relies heavily on the tiny computers we carry around in our pocket. Smartphone devices give us driving directions from point A to point B. They help us find our way to that secret hot spring, stunning vista, or backcountry waterfall. 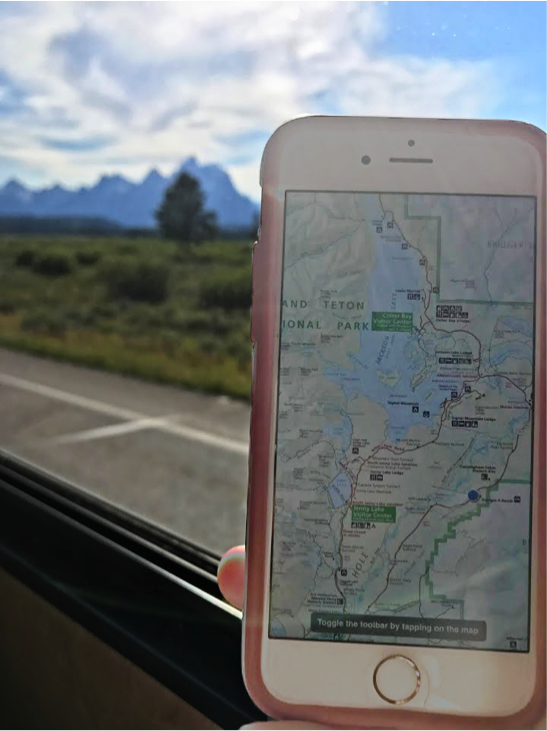 But, many of these maps and apps rely on the technology of the front country – cell service, to calculate driving directions or ask Siri where the closest ranger station is. The Maplets app in action in Grand Teton National Park. So, what’s an ill prepared camper to do? Enter Maplets. Maplets is an offline mapping app that allows users to download georeferenced maps (or georeferenced your own maps!) to a smartphone device and use them, along with the GPS in the device, to find your way around the world – even in the middle of nowhere. Once a user adds a map, it is made available to all Maplets users. There are 1000’s of georeferenced maps available in the app. So when I overheard someone mention that the National Park Service (NPS) Visitors Center had free wifi, I knew what to do. I scurried over, connected to wifi, downloaded the Maplets app on my iPhone ($2.99 – worth every penny) and did a search for user added maps. Several maps of Tetons and Yellowstone popped up, including the official NPS park map. A quick download to my device and suddenly, I was no longer lost in the woods. That familiar blue “current position” marker was placed perfectly on the park service map, indicating my location at the Visitor Center. For the next two weeks, we used Maplets to find our way through the parks and wild places of the west. Highlights of the trip included hikes to glacial lakes in the Tetons, a visit to Old Faithful and Grand Prismatic Spring in Yellowstone, and sleeps in the rugged Sawtooth Mountains of Idaho. So, Maplets FTW (for the win). Be sure to check it out for your next visit to the backcountry! You’re guaranteed to be tagged as the “geo-geek” of the family (an honor, IMO (in my opinion)), but you might just save the day when you’re all looking for that hidden trailhead.